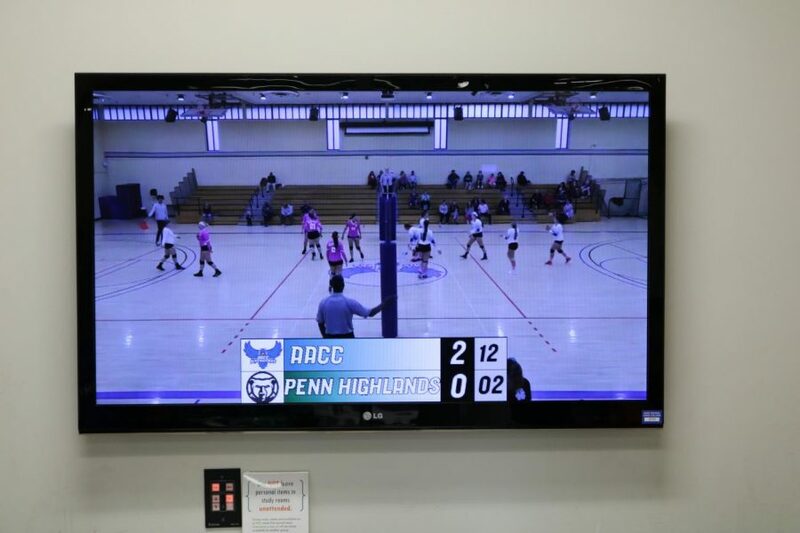 Volleyball is one of the sports AACC Athletics streams on its YouTube channel. AACC’s athletics director said in October more people have been watching live streaming for sports games when they can’t attend them. Live streaming started in fall 2017 with soccer and lacrosse home games. Athletics Director Duane Herr said he hoped fans and parents of team members who couldn’t make it to campus would watch them on the Athletics Department YouTube channel. More than 6,000 viewers have watched the games online—either live or after, Herr said. The most-watched AACC game so far, with 462 views, was a basketball competition between the Riverhawks and the Howard Community College Dragons. The Riverhawks won 91-89. “We have had multiple streams that have reached a couple hundred … when we have bigger tournaments,” said sports information specialist Zach Malone. “We wanted to reach people who weren’t able to see the games. Once the stream is finished, it is saved and uploaded to our YouTube channel, where we always want people to have access to,” Malone said. “In real time it might not be that many [people attending], but we are trying to engage an audience that might not be able to get to a game,” Herr said. Basketball forward Matt Kern said his grandfather watches the streams instead of coming to campus. “Streaming helps people see their family,” he said.